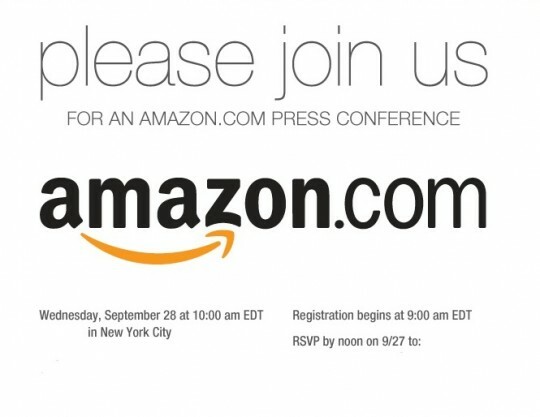 Just hitting the wires this morning is the long awaited press invite from Amazon. In what appears to be nothing but an invite and a tease for an upcoming press conference being held by Amazon we can only expect this to be the long awaited and much rumored Android Kindle Tablet. While we heard some pretty compelling information earlier this month based on some hands-on time with the secret device, nothing else is really fully known at this point. This Wednesday, September 28th right in NYC at 10 AM the world will know. Sadly this invite like mentioned above is pretty plain and only lets our minds wander. We’ve been seeing rumors about an Amazon tablet for a while, just like these claims of Foxconn being the manufacturer. Hopefully all the details and more come from this event next week. This may be just a new Kindle or e-reader but we have a feeling Amazon will be talking about and announcing much more than just a e-reader. All the speculation will be over soon so be sure and stay tuned right here at Android Community for all the details.